Yesterday afternoon found us crossing into the "Land of Lincoln", which ironically even Lincoln himself would not recognize as his birthplace. It has changed a bit since then, wide open corn & soybean fields with just knots of trees here and there, rolling hills and lots of traffic on Interstate 74 keep you on your toes. Plenty of construction here and there for your entertainment also. 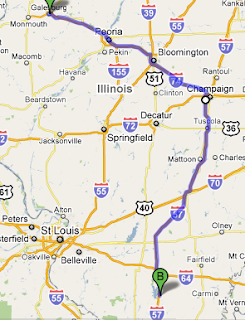 I'm sure Illinois is a lovely state, but from 74's view, there's not much to see. Just as well, traffic is intensely bothersome and it's just as well you keep your attention on the road and all the shenanigans going on about you. Road surface conditions vary from excellent, to appalling, never a dull moment! Day 1 one came to a close in Galesburg Illinois, a place we attend an Event at every year, (Galesburg Heritage Days), so we were expecting to stay at Stoney Lake Campground on the North side of town. We had never been through this area this late in the year so we got the unpleasant surprise that the campgrounds in the North end of the state, (and all others in the area), had closed November 1. Not to worry though,we just headed over to the local Walmart and asked if we could stay for the night. The manager was very accommodating, so we just parked, put out the slides and kicked on the generator for the evening. This morning we had some coffee, packed up and got on the trail early hoping to miss some of the action on the road, but we had the unnerving experience of driving into the rising sun for some time. Afternoon found us bucking a SW wind so after struggling with it for a couple of hours we decided to live it up and stop at a nice RV Campground. We chose Wittington Woods Campground near Rend Lake because of it's close proximity to Interstate 57 and great reviews on Google Maps. It turns out to be a delightful place, there are plenty of lots that are spread out enough to let the slides out and still not be a bother to your neighbor. The campground features large old oaks and nut trees, a great pavilion in the woods, pool, laundry, wifi and other amenities. The pads and roads are freshly re-graveled and most sites are pull thrus. This campground is ideal for big rigs, easy in and out. We may stay a couple days, it's so nice here!